I know, we're breaking the cardinal rule of LUNCH (6 weeks minimum before repeating a lunch) but the chilly weather's making us supremely lazy. 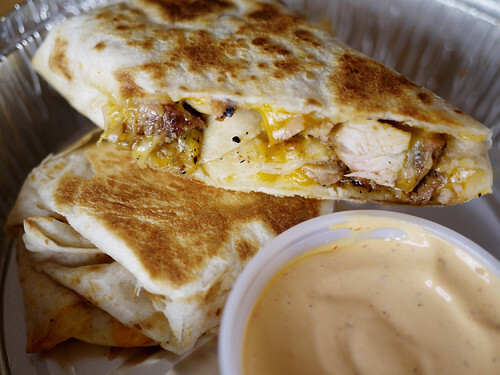 It's only been 15 days since I solo ate at Calexico, but 4 months for M. In order to keep it lively, and not bore you with more praises for the carne asada burrito, we tried a pollo asada quesadilla too. See how thoughtful we are? It's not the most fantastic ever, but it is really nice how they roll it, squish it and grill it some more. We'd totally eat it again.